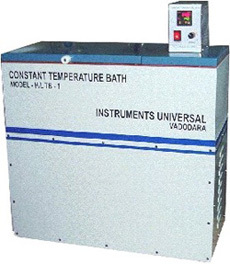 Precision Temperature bath designed for precise research work and it is to maintain absolutely steady and uniform temperature in bath with the stability of + / - 0.1 degree centigrade in entire range of 5 degree to 90 degree centigrade.. It is available as per customer requirement. It has inbuilt with digital & capillary type over temperature protection and specially humidity resistant molded stainless steel heater coil & stainless steel circulator body.